As if there hasn't been enough excitement here for the month, I'm going to do a bit of a brain dump all over this blogpost. There are lots of small great-newsy items that are adding up to one big post of sharing, so before the list gets unmanageable, I've just gotta get this out there. To keep my rambling in check, and so I don't bore you to death, I'll just bullet it, kay? my lovely friend Michele, AKA Duff (who, incidentally was the first real life person to ever pay real cash money for something I'd made and donated to Craft Hope for Haiti on Etsy), participated in the SMS giveaway day and I was the lucky recipient of this luscious Marcia Derse fabric. the same Duff alerted me to the fact that Skooksplayground made a beautiful version of my Crop Circles Table Runner and posted about it here. It's a stunner made for a wedding gift. Correspondence ensued and at Skooks' prompting, I decided to create a flickr group called Poppyprint Projects for anything made from one of my tutorials, or inspired by one of my projects. Skooks and I are currently the only esteemed members, but on the off chance someone else has made anything, please join us and add a photo so I can gush over your creations! And speaking of gushing....I just have to share that (gasp) Amy Butler herself (or, possibly one of her people) left a very kind comment on one of my flickr photos. Remember back in November, Jo, Andrea and I all held hands and made these bags together on retreat? 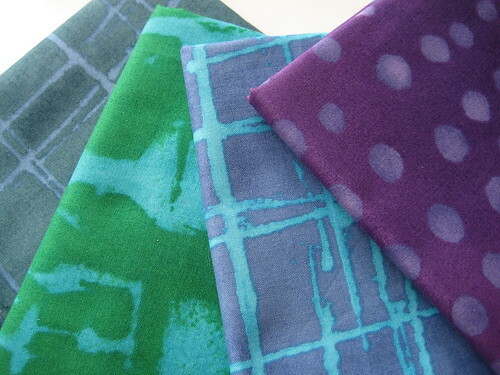 These are fabulous, great job and great fabric choices, I love them all! EEP! (I said that) I mean, she LOVES them! I had a Sally Field moment for sure. 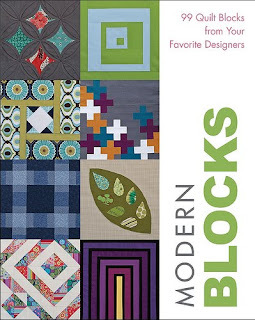 In the fall, there will be a fabulous new offering coming out from Stash Books called Modern Blocks. Guess who's got a block pattern in there? Yup. Me. Shucks. Plus, many of my friends (and bloggers you also know and love) are also featured in the book. There's going to be a big party when this book comes out! 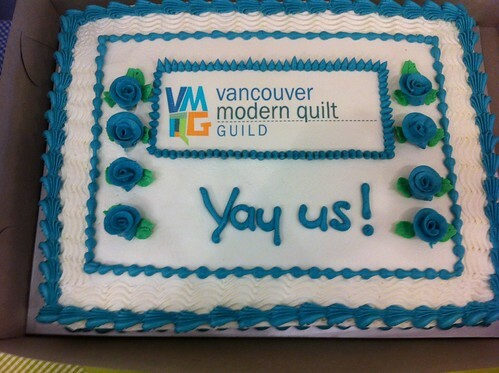 And lastly, for today at least, I want to say HAPPY ONE YEAR ANNIVERSARY to the Vancouver Modern Quilt Guild! Woohoo! We had a super fun anniversary party last Thursday. There were over 50 people in attendance and everyone won a door prize. 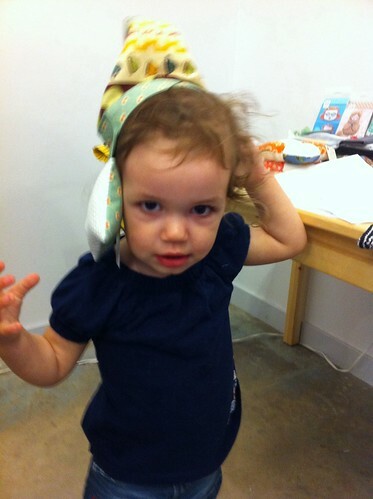 This little visitor found something fun to do with the thread catcher I donated for the prize table. We showed our Kona solids challenge quilts and they are all incredible. As soon as our photographer Sonja uploads the photos, I'll point you in the right direction to see them. You'll be blown away by our guild members' creativity! All of the quilts are amazing. Thanks to Heather (our membership coordinator/treasurer) we can proudly wear out guild on our sleeve! Okay people I'm sure you've had enough excitement for one blogpost. It's time to get back to the sewing machine to work on this if I'm going to get it done in time for Saturday. If you're looking to get a jump on a GO!Baby giveaway, Amy is really speedy and she has started hers today! Wow! What a load of great news, Krista! I'll have to go join your Flickr group and post my sweet baby's loopy blanket! And how did I possibly miss the handbag photo before??? Those are fabulous!! I love all your awesome news. WOW! AB commented on a Flickr pic of yours. Sweet!! So much fab news - not suprising since you're so very awesome. Yes you are. Whoa, I missed those bags the first time. They are lovely! Great news all around! 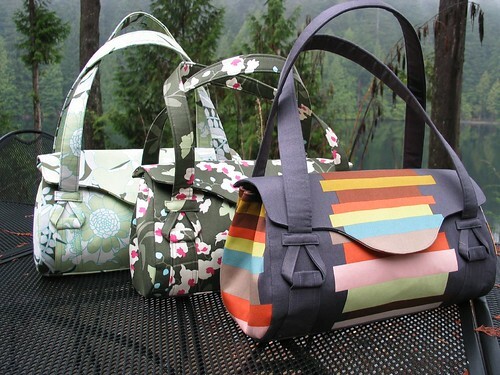 I like the blossoom bags too. Congratulations on the book too. I will definitely purchase one and...check out the other sites. Are you still doing Hope for Haiti? I went there for the summer when I was 13 going on 14...great experience and it was way way back there in time but they are still very much in need...more so and I don't want to forget that. Well, you sound happy today :) Enjoy it all! How fun to get a comment from Amy herself!!!! Great bags too! What a great day! I am thinking we need a guild in Winnipeg.....I so need some locals to quilt/obsess with!! And yay for your block in the book!! Wow, that really is a load of good stuff! You are on a roll. 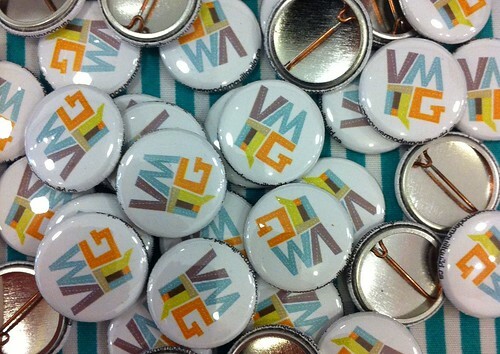 I love those VMQG pins. I wish I had the energy (or a partner in crime) to get our guild going here! I love reading all that good news! Yay! The birthday party was fun, the cake was good, and I proudly wear my little pin. The Kona challenge quilts were amazing! Can't wait to see this book when it is released - yay you, and so many others, too! This is the part where if I was living close by I'd rush over with snacks and treats and freak out with you on the porch as soon as you opened the door. Yeah, that sounds awesome. Congrats on all your big news! That is FANTASTIC! What a happy post; congratulations on all your wonderful news! Sharing good news is wonderful, isn’t it?! Congratulations on all the happy news and enjoy! You got it going on Krista!!! In particular, congratulations on the book contribution, you must be so excited about that (I know I would be over-the-moon), and the Amy Butler comment (I would've fallen off my chair)! AMAZING!!! wow, that is a load of very cool stuff, Krista! Thanks for sharing all of that! Btw, where did you get the pic of what the block book cover looks like? I can't wait to see it in person! Hokey Dinah that IS a load of good news!!!! Congrats on all fronts. Okay cannot WAIT to see the book and will def buy a copy. My first friend in crafty print woohoo!!!!! A flickr group? OOhh, you're big time girl! and oh, so deserving...I'll have to make something now just to be in the cool group. I think your comment about me purchasing your work cracks me up--it took me all of what-literally 30 seconds to get your wondrous work into my shopping cart & held my breath until paypal went through! p.s. have you checked out Mumford and Sons? I think you might like their music. yay for you! 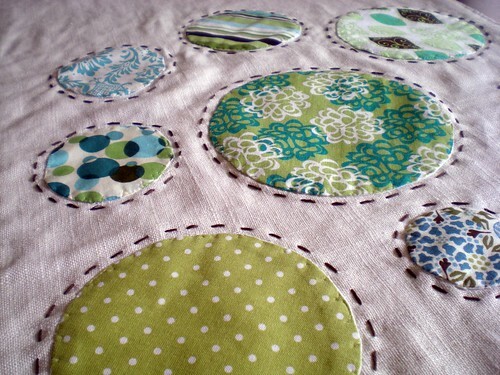 i love your blog and i am going to be copying your solids challenge quilt. i LOVE it so much! i will gladly add it to your flickr group when i start and finish it!